An Egyptian activist mourns: Egypt’s hopes for a democratic future have been replaced by a war zone. Two years ago, as Egyptians, we had incredible dreams for our country’s future. How did it come to this? 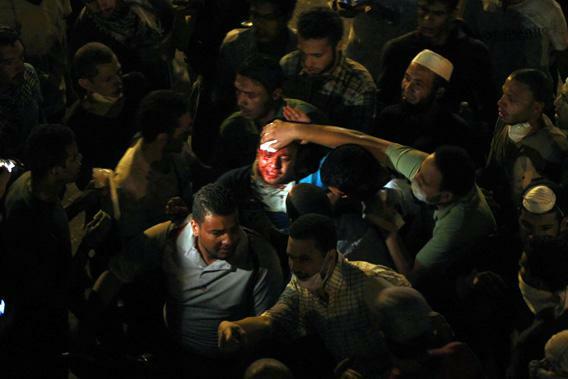 An injured supporter of deposed Egyptian President Mohammed Morsi is helped during clashes with riot police on the October 6 Bridge in Cairo on July 15, 2013. This article originally appeared on madamasr.com. I sit, for the 12th hour now, alone and struggling for what to do. For the first time since I got on a plane for Egypt on Jan. 29, 2011, I am at a loss. We thought we could change the world. We know now that that feeling was not unique to us, that every revolutionary moment courses with the pulse of a manifest destiny. How different things feel today. I will not bury our convictions, but that feeling—youthful optimism? naiveté? idealism? foolishness?—is now truly and irrevocably dead. I mourn the dead and I despise those killing them. I mourn the dead and I despise those sending them to their deaths. I mourn the dead and I despise those who excuse their murder. How did it come to this? How did we get here? What is this place? It is Feb. 12, 2011. Hosni Mubarak has fallen. In the morning I will fly to America to finish a job, before moving permanently to Cairo to help build the new country. I am sitting on my mother’s balcony. We are smoking cigarettes and drinking tea to keep out the cold and talking about all that we’ve seen and done, about all that we’re going to do. Everything, on that night, was possible. Our conversation ranges from the grandiose of the global revolution to the practical rethinking of ministerial appointments to the minutiae of the requirements of the film school that should be established. We talked through the night. I took notes. By the time I returned from America, the Army had cleared two sit-ins from Tahrir Square, begun court-martialing civilians en masse, and assaulting women protesters with “virginity tests.” The revolution now is smaller, but serious, focused, and under sustained attack. The unfallen state, the deep state, the client state; once a month, every month, it attacks. It clears Tahrir in March, April, August, and December. It attacks protesters at the Israeli Embassy. It envelops downtown Cairo in a November mist of Pennsylvanian tear gas. It rains down rocks and Molotov cocktails from the roof of the Cabinet building. 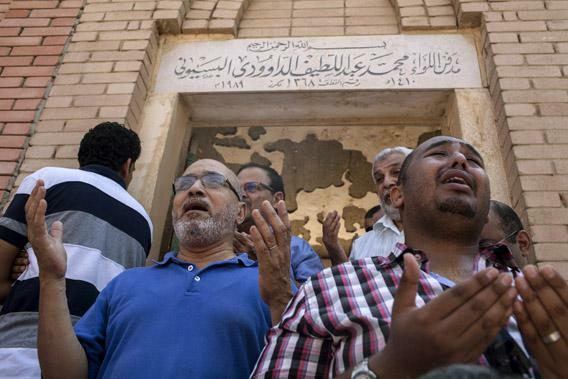 It welds shut the doors of the Port Said Stadium death trap. Every month, people die fighting it. 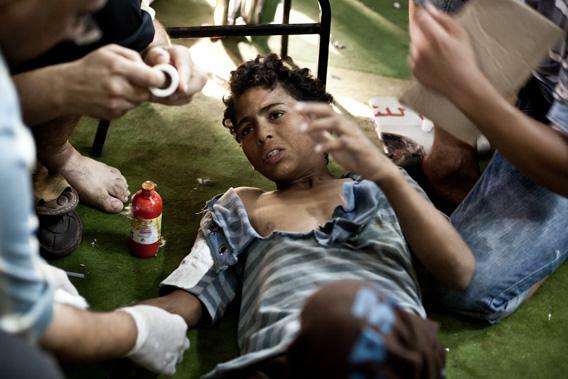 A wounded boy is treated on the floor of the Taamin Sehi field hospital during clashes in Cairo on Aug. 16, 2013. There were moments when we could have broken the Army’s grip on the country. We should have stayed in Tahrir after Mubarak was ousted. Tahrir was in the driver’s seat and hadn’t yet acquired the politicians to sell it out. But we left. Everyone said they would be back the next day, and then, somehow, they weren’t. People wanted to shower and to sleep in their own beds. Then spontaneous cleaning brigades of earnest patriots spread through the city and by midday everything was nice and tidy and gone. In November 2011 and in January 2012, the streets echoed with chants demanding the end of military rule. But now it had become the self-appointed role of the politicians to translate street action into political gain. Now, the Army had people to talk to. Had all the forces that were supposedly against the military—the revolutionaries, the liberals, the Brotherhood, and the Salafis—ever truly united, where might we be today? Dead, possibly. But maybe not. Maybe somewhere closer to a civilian state. A real, ideological alliance was never possible. But a tactical, practical one just might have worked. But rather than work together, each party repeatedly met with and made deals with the Army, consistently placing the generals in the strongest tactical position. Everyone was to blame. The old, moneyed liberals who presented themselves as allied with the revolution lived in relative comfort, had historical ties to the military, and routinely demonized the Brotherhood. The revolutionaries’ disdain for high politics meant that they effectively removed themselves from the equation. The Salafis were only ever interested in the deal that brought them the most power and their prized ministries—education and health. And the Brotherhood, long enamored of its ability to put numbers on the street, was arrogant and duplicitous from the beginning—making serious electoral promises to the liberals, lobbying America, and offering the Army immunity and oversight of itself. When in power, Mohammed Morsi refused to take on the Ministry of Interior. Instead, he appointed Ahmad Gamal Eddin, who, as chief of the Assiut Security Directorate, almost killed off the revolution in January 2011 and then was the Supreme Council of the Armed Forces’ chief of general security at the time of the Mohamed Mahmoud and the ultras massacres. The main enemy of the people has always been the security state—the police and the military. We will never get anywhere until they are dismantled entirely. There was a moment when that could have been achieved, when a civilian state could have been built. But Morsi and the Muslim Brotherhood would have had to choose the challenge of working with the disparate and bickering forces of the left and the liberals over dealing with the organized certainty of the military. It’s June 27, 2013. We’re sitting in Estoril, at the corner table under the television. Of the six of us, three genuinely believe that the marches on June 30 will be very seriously attacked; that it is the perfect moment for the old National Democratic Party networks to throw the country into chaos and force the military to take control again. There is talk of kill lists. I spend hundreds of pounds on goggles I hope will keep the birdshot out of our eyes. I don’t want to march that day. I want Morsi gone, but the voices we are hearing are all remnants of the old regime, what we call feloul, and online instructions are circulating insisting no one chant against the military or the police. But all my friends are going, so what choice do I have? To watch them die on television? We read it wrong. The blood that the Army, the regime wanted was not ours. Not this time. Is it because we are now irrelevant? Or because the backlash would have been too strong? And on July 3, just as they did on Feb. 11, 2011, the military staged a coup. In February they removed Mubarak to sap public pressure and demobilize people. And it worked. What happened this time? Did the street pressure force the Army to act, or did the Army create the street pressure through Tamarod to get what they wanted? Mourners attend the funeral of Ammar Badie, son of Muslim Brotherhood Supreme Guide Mohammed Badie, at the Katameya cemetery in Cairo on Aug. 18, 2013. But what do we have if not our beliefs? They are the foundation of our actions, of our identities. And it was transformative: the belief we all shared, for a moment, in each other. In an eternity of disappointment and greed and malice, that moment, that moment in which being human was finally worth something, in which having a community was preferable to being alone with a book, had a value that will never be lost. You cannot underestimate how important these two and half years have been for people, how empowered, how unafraid people were. The existence of the revolution should not be confused with the existence of a political leadership and process. The revolution is dead when we say it’s dead. The revolution is dead when we will no longer die for it.